Music is a method of communication, of sharing thoughts, feelings and experiences. People love to listen to music that TELLS something, that reflects a certain state of mind, a certain feeling, that brings them motivation and inspires them to grow, to become stronger and kinder, that gives them a purpose in life! Music is an universal language and – metaphorically speakings – it has the power of touching our heart and spirit directly, without the need for ‘translation’ . However, one thing is sure: the more we learn about this language and the more we study all it subtleties – the better we’ll be able to understand it! Have you ever wondered why a certain great composer created a piece? It’s because he wanted to share something: an idea, an emotion, a state of mind etc. 2. Learning how to transfer this vision into ‘audible reality’ by using the specific possibilities of our instrument – the piano. By using certain expressive and technical means (a good hearing, a ‘prolific’ imagination, a correct posture, the ‘whole arm action’ principle, a quality piano tone, relaxation, freedom of motion, finger velocity etc.) we gradually create the ‘audible’ painting – we bring to life the concept of the composer. 3. The last step is sending this message to the audience – playing in a concert, or making a recording etc. By the way, I describe in detail the process of creating a mental image of a certain piece in my report A New Perspective on Piano Phrasing! Once again, I will remind you that the activity of any performer should be subordinated to this major goal: expression, meaning, art! The meaning of a piece is always hidden in the musical text – you just have to learn how to find it! Let’s make a quick review of the the main elements of the musical text – and discover how they can help us to understand the piece. 1. The genre. First of all, analyze the genre: it’s obvious that an Etude has a different meaning than a Nocturne, a Ballade, a Prelude or a Barcarole. Study the history of each musical genre – this way you’ll learn a LOT about the meaning of the pieces written in that particular genre. For example, when you’ll play a Minuet you’ll be aware of its gracious dancing character; when you’ll play a Toccata – you’ll want to create a sparkling, dynamic character; an Impromptu will immediately make you think about a free improvisation; and so on! 2. The tempo and character indications. Take a look at the indication at the beginning of the piece. Many composers, besides writing the tempo (Largo, Adagio, Moderato, Andante, Allegro, Presto etc.) also indicate the main character – for example giocoso, cantabile, dolce, grave, maestoso, lamentoso etc. These indications are immediately ‘shifting’ our focus to the needed feeling and atmosphere! Do you see how suggestive the composer’s indications are? He gives us the tempo (Lent), the character (grave, in a style of a Sarabande but without strictness), and also performing recommendations (expressively and gently, without hurry). Also, the title itself – Homage to Rameau – is extremely suggestive! First, you have to learn who Rameau was, of course! Then, you have to study some of his compositions and their character. Only then you’ll be able to play this ‘Homage’ to his music – also keeping in mind all the particularities of Debussy’s impressionist style. 3. The style of the composer. Even if two pieces have the same title or genre – they may still have entirely different characters – being written in different epochs, by different composers. For example, let’s compare a Prelude by Bach with a Prelude by Chopin, or a Prelude by Rachmaninoff with a Prelude by Debussy! Yes, the genre is the same – but the character is inevitably different, being a reflection of the composer’s unique approach (and also of the style of the epoch). You can read more about styles in my articles Using the Piano Pedals: On Style and Notation and The Pianistic Gesture and the Dramatic Content of the Music. 4. The time signature. Time signatures are extremely suggestive when it comes to the character and meaning of the music. A 3/4 time signature (or 3/8, 6/8, 9/8) is usually indicating a dancing character; 2/4, 4/4, 2/2 suggests a more ‘balanced’ structure. There are also unusual time signatures like 7/8, 1/4, 5/8 – usually being inspired from folk music – which again tells us a lot about the meaning of the piece! 5. The tonality. Every tonality has its unique ‘color’. Learning more about tonalities can help you understand the meaning of the piece much better! 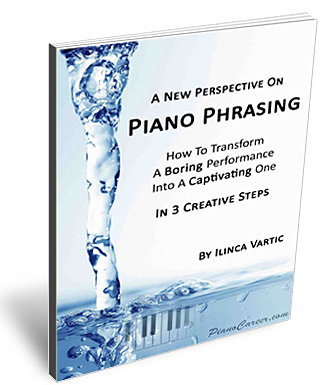 You can find more information on this subject on the Private Members Forum at PianoCareerAcademy.com. 6. The structure of the piece. At our Academy, we have an entire subject called ‘form analysis‘. When we analyze the form and structure of a certain piece, it suddenly becomes much easier to understand its meaning. For example – is it a short or a long piece? What kind of structure does it have: tri-partite (it has 3 main sections), bi-partite (2 main sections) or maybe it is an ample-form piece in 3-4 movements? Are the sections/fragments/movements homogeneous (having the same character and tempo) or contrasting? For having access to the remaining 5 important criteria that we use in the Russian piano school for making a complete musical analysis of a piano piece – join my Piano Coaching Program at PianoCareerAcademy.com! On the Private Members Forum you’ll have access to the entire article – and you’ll also find many other exclusive video and written piano playing tutorials. Plus, you’ll be able to ask ANY piano question, anytime, and receive personalized, detailed, professional piano advice! And now, for ‘dessert’ ;), another important thing: music is a flexible art. We can all imagine something different when listening to the same piece. For someone, a melody may reflect the beauty of nature; for others, the same melody may create an association with a specific feeling – love, admiration, reflection and so on. So it’s great to listen to your teacher’s advice, but at the same time to listen to your own feelings and impressions! How do you feel when you listen to this music? What does it make you think about? Does it bring you light, joy – or maybe it creates a nostalgic feeling? Or maybe it makes you angry? There are no limits to what we can express with the help of the piano sound! This was a very interesting article Ilinca 🙂 Thank you so much… Maybe in the future, will you be able to do another one on how to understand whether a piece is from the classical, modern or baroque period just by listening to it? But your suggestion is definitely a great one – and I’ll include it in my current to-do list! This article is really very helpful. It helped me to explore my imagination of a certain piece that I play. Yes, I think this is a great idea! You can certainly write down your impressions about each piece, and the feelings it triggers – this is a wonderful way of exploring not only the piece’s expressive potential, but also its influence on your imagination and creativity. Your teaching style is an absolute breath of fresh sir; so positive and thorough! I just joined your forum and am looking forward to using it. I’ve taught piano for many years and find that I come from the same type of philosophy. But my struggle has been that I’ve believed this positive approach for all my years of teaching, yet I fall into a “task master/perfectionist” mode sometimes and realize I’m not practicing hat I preach as much as I’d like. You are the perfect reminder for me of how I want to approach the piano for myself as we’ll as my students! Thank you so much for all your advice… You summarized so well of what I was taught many years ago; however, I have forgotten most of them. By the way, where are you now ? in the U.S. ? I think your holistic piano method is wonderful, but to implement what you are teaching you need to master the piano Technic first.It is like somebody want to study the Russian literature without knowing the Russian language. I hope that i am wrong with my argument? Yes, you are wrong in your argument :). Meaning and expression come first, while technique is only a means to this purpose. We cannot master the technical means without understanding the purpose, the bigger picture. We can achieve a brilliant technique only if we subordinate it to the musical ideas we want to express. To make a comparison – language is not learned separately from conversation, or from literature for that matter. We learn the Russian language BY reading literature (gradually increasing the difficulty of the things we read), and also by having conversations that have meaning. Language without meaning is nothing – just like technique without meaning is nothing. Similarly – we cannot develop our technique (the movements of our arms/fingers) without understanding WHAT we need to play, HOW it should sound and WHY we’re playing it in the first place. Learning technique separately, besides being the most boring thing in the world LOL – is also pointless and doesn’t lead to any type of progress. You can learn more on this very important topic by watching/reading the tutorials available for the members of my Piano Coaching Program at PianoCareerAcademy.com ;). i will like to be part of your school. am a residence of Ghana in west africa. You will find a step-by-step registration guide in our FAQs – answer No. 33.